What are the Orvis Encounter Waders Best For? Among Orvis’ broad line of fishing waders, the Encounter Wader offers anglers Orvis quality found in higher-end models at a value-minded price point. It's is a budget-minded, breathable wader built along a similar construction pattern to waders twice its cost. Comfortable, durable, and easy-on-the-wallet are all words that should come to mind. This is an excellent value, breathable wader best intended for fishing applications. Anglers will appreciate the comfort, breathability, and body specific sizing. Most breathable waders follow a similar construction pattern. However, there are certain features that set some apart from the rest. The Encounter Waders are built with a breathable four-layer nylon construction, the same found on waders much more expensive. Additional protection is added on the highest wear areas of the lower legs to extend the lifespan of your investment. The fit has been enhanced to provide anglers with optimal comfort. It now models its fit after the award-winning Silver Sonic line of waders by Orvis. On top of a newly enhanced fit, it's offered in a broad range of sizes to fit anyone from large men to women and even kids. This vast number of sizes offered is a rarity among waders in this price spectrum. As with any good wader, the Encounter Wader comes with a few welcome features. Integrated nylon gravel guards with lace hook assists in keeping your wading boots free of debris. The belt loops and included elastic wading belt are an excellent safety feature when getting into deeper water. Lastly, the handwarmer pocket and front storage pouch are akin to those on higher end. Enhanced Fit - Comfort and performance were added to the newest generation of the Encounter models. Modeled after the award-winning Silver Sonic series by Orvis, the new fit will be appreciated by anglers. On top of that, the huge range of sizes available for men, women, and children helps to ensure everyone has a comfortable and proper fitting wader out on the water. Reinforced - Additional reinforced fabric on the high wear areas of the lower legs is a feature found on most quality breathable models. Anglers will inevitably spend some time crouched or resting on their knees. Having extra durability on these high wear areas will do wonders for extending the lifespan of your waders. Functional Features - Many great features are offered that are comparable to much more expensive options. On those colder mornings, you will certainly appreciate the side-entry handwarmer pockets located on the chest of the waders. In front of the handwarmer pockets, there is an additional storage pocket for smaller items you want close at hand. The gravel guards are another feature that I certainly seek out and are standard on the stockingfoot Encounter Wader. Durability - These may not match the durability of much higher-end waders. Sometimes, when spending the extra money on those top-of-the-line models, you are paying for more durable, high-performance materials and enhanced fabric seams. Taking precautions not to tear your waders, proper maintenance, and sealing any holes initially will all aid in durability and extending the lifespan. Warmth - Keeping you warm is not the selling point of breathable waders. If you are looking to fish in very cold waters and don’t need to be worried about getting hot and clammy, you would be best to go with a different pair of neoprene waders. The Encounter Wader is breathable and does not offer much insulation. If you occasionally fish in colder conditions, you still retain the flexibility to layer clothes underneath. 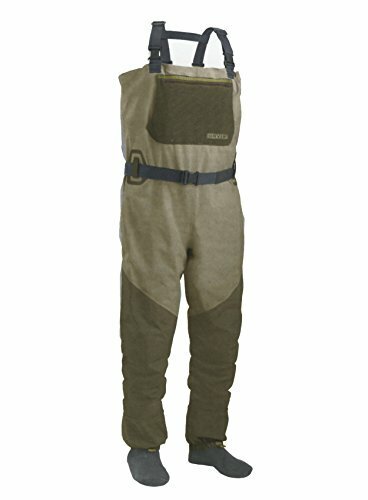 This is the pair of waders for the budget-minded angler. Or for the angler who doesn’t want to break the bank on the highest end gear but doesn’t want a significant sacrifice in quality. The Encounter Wader by Orvis delivers the same quality engineering found in top-of-the-line models in a value-minded package. Breathable waders are best-suited for anglers who anticipate fishing in fair to warm weather conditions. The benefit of the breathable nylon is the ability for water vapor molecules (evaporated sweat) the pass through the fabric while still being waterproof. On a warm summer day, you will be glad your waders are breathing instead of being hot and clammy like rubber models. These are available in both a bootfoot and stockingfoot option. I myself, prefer to purchase stockingfoot waders. I recommend stockingfoot to better optimize the fit of a wading boot versus a clunky integrated rubber bootfoot. A stockingfoot is an excellent option for anglers who anticipate walking more than a few hundred yards on a fishing outing. If you don’t plan on covering ground in your waders, a bootfoot wader may be more convenient for your application. For anglers of all shapes and sizes, the Orvis Encounter Wader likely offers a well-fitted size. These are available in a wide breadth of sizes often not found in comparable waders. No more awkward fitting waders, even for those “not so normal” body builds. For anglers that require waders for their style of fishing, price can be an issue, particularly on high wear items like breathable waders. Thankfully, Orvis has offered budget-conscious anglers an option without a sacrifice in performance. The Encounter Wader brings in the best of both worlds with a value-focused design that brings in elements of higher end waders without breaking into that price spectrum.